Lee's Boston Drum Builders Blog: Who was F. W. Neptune? Who was F. W. Neptune? Outside of George Lawrence Stone himself, the man most responsible for the outward face of George B. Stone & Son in the early - mid 1920s was Fred W. Neptune. 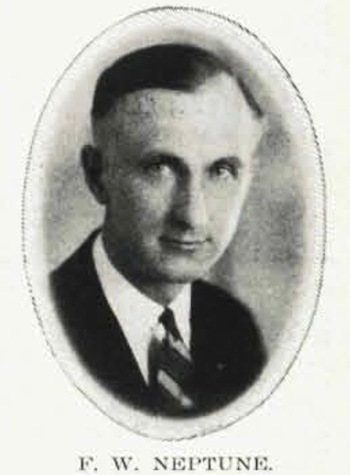 Formerly with J. C. Deagan Inc. of Chicago, Neptune was hired by Stone as Advertising Manager in May of 1922 and remained with the company until November of 1926. Neptune was in all likelihood the driving force behind a push made by the Stone firm to become more visible in industry publications, among them the Music Trade Review which is searchable online. Without hardly a mention of Stone & Son in the publication prior to Neptune's hiring in 1922, regular updates from the company begin appearing immediately thereafter. 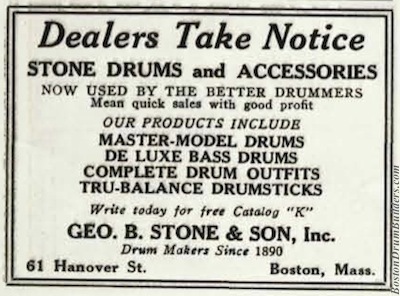 It is almost surely in Neptune's own words that over the next several years we read about several new Stone innovations including the new Master-Model drums and the oddly designed Tru-Balance drumsticks. Neptune also would have been largely responsible for Stone & Son's lengthiest and most comprehensive catalog ever published, Catalog K which was released in late 1924. But then in 1926, as quickly as the Stone news items had appeared in the Music Trade Review, they ceased. And while this is only one such publication which may or may not represent a trend in Stone's marketing efforts industry wide, it is surely not through happenstance that the timeline here coincides exactly with the arrival and departure of Neptune. 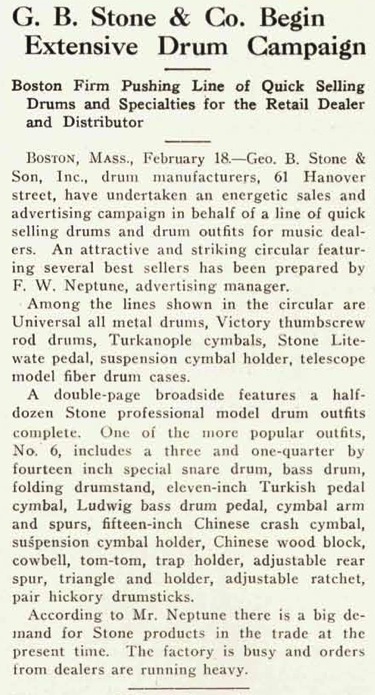 Perhaps the escalation in advertising at the time of Neptune's hiring represents on a broader level Stone's attempt to keep up with industry kingpins Leedy and Ludwig & Ludwig. And perhaps Stone's ads ceasing in the MTR is one of the first signs of the company's resignation that they had advanced as far as they were able and were now watching the industry pass them by. Or maybe this rise and fall in advertising presence is merely evidence of the coming and going of an active advertising manager in Fred W. Neptune.